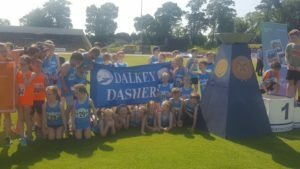 The Dalkey Dashers commence training for the Community Games on Wednesday 03rd April at 7.00pm. Training takes place every Wednesday evening from 7pm until 8pm in the Loreto Dalkey school hockey pitches. Everyone between 6 years and 14 years living in the Dalkey area are welcome. There is a one off fee of €5 to register. Parents coming with children MUST park on Harbour Road. We are also looking for new volunteers either Parents or TY Students who are willing to help.